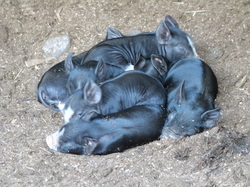 Berkshire pigs recently born to sow Penny! This is your chance to own your own piglet! What is Rear a Pig Scheme? Have you ever wanted to own your own pig? Then this is your chance! 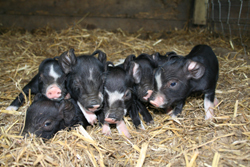 You can choose a piglet from a new born litter or we can choose one for you. 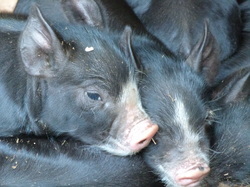 From that moment on, you will be the owner of a happy, contented piglet that we will rear for you. 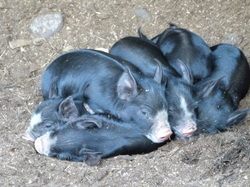 You will be given periodic updates by email, including photographs of your piglet's progress. You will also be kept advised every step of the way whether it is a change in diet, weaning, change of living quarters etc. You will also be more than welcome to come and visit your pig should you wish to, why not tie it in with a course whilst you're here and meet the rest of the gang. We rear our pigs as naturally as possible. They are kept in their natural woodland habitat outside all year round and kept in small family groups with acres of land to roam in. We do not force our piglets on, which means that instead of reaching slaughter weight at around 16 weeks as a commercial pig would, ours can take as long as eight to ten months. This is because they are an old-fashioned, slow growing breed which allows time for flavour to naturally develop. When the time comes and your pig has reached the approximate weight you have selected, we will take them to our local abattoir. This is only about 25 minutes away from home and all our pigs travel in pairs to avoid stress. Following slaughter why don't you join us on a butchery and pig processing course (at a discounted price) to process your pig. 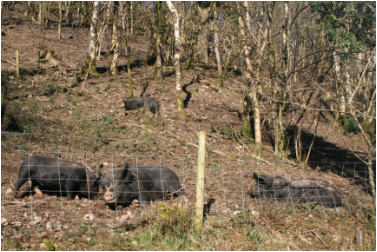 You will be able to joint your pig and make sausages, bacon, pate and brawn - whichever you fancy! Our aim is to use every bit of the pig; our ethos is nose to tail eating. We don't put people that don't know each other in groups so it will just be you, us and your pig. This course takes two days and we will provide you with everything you need to take your pig home at the end of the second day. We aim to make the time fun and show you what can be achieved in a normal family kitchen. Alternatively we can butcher your pig to your specifications and send the meat to you by courier at a P&P cost of £39.50 for next day delivery. iiAll you pay for is the carcass weight at slaughter which is £5.25 per Kg. We do not charge extra for updates on your pig during their rearing. The weight of the pig varies between 50 and 60 Kg and takes around 8 to 10 months depending on time of year and weather to reach that weight. We request a £100 deposit to reserve your pig, with the balance payable at slaughter once the final weight is known. What better way to end your rear a pig scheme than butcher and process your pig yourself to your specifications. See our Butchery and Pig Processing Course for full details of the course content; the two days can be tailored to your needs and requirements as it is exclusive to you.